About DC Sports Strut Bars: DC Sports Strut Tower Bars are designed to significantly improve handling by eliminating the flex of the body that commonly occurs during fast driving, cornering, racing, etc. DC Sports Strut Tower Bars are of the utmost quality and durability. The DC Sports Strut Bar comes with everything you need for a fast and simple installation (usually less than 20 minutes with basic hand tools) and includes instructions. DC Sports uses a dual bar design with an integrated steel brace in their strut tower bars, virtually eliminating body flex for improved handling and drivability. 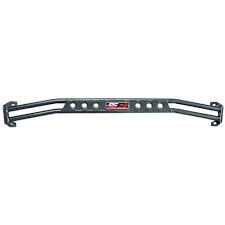 The part number for this item is CSB1001 and it fits 1995-1999 Mitsubishi Eclipse RS GS 2.0 models.